Rolwaling is a wild and lonely high east/west valley below Gauri Shankar 7145m just south of the Tibetan border with Thame in the Khumbu or Everest region at its eastern end. This is a remote and culturally diverse area occupied by Sherpa, Tamang and Chhetri people Starting from Barabise in the west and passing Tinsang La, the trail descends to Bigu Gompa, a Buddist nunnery and follows the Bhotekosi river before turning into the Rolwaling valley. The route goes to Bedi, the last permanent settlement at 3690m and Na, a summer settlement at 4183m before ascending a grass-covered valley to beautiful Tso Rolpa lake. It then traverses a moraine on the north side of the valley and the snout of the Tram Bau Glacier. Great care must be taken on the glacier and the crossing of the Tesi Lapcha La 5755m into the Khumbu can be difficult. 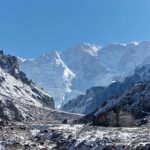 This spectacular route then drops to Thame and follows the Bhote Kosi river to Namche Bazar and on to Lukla for a flight back to Kathmandu. 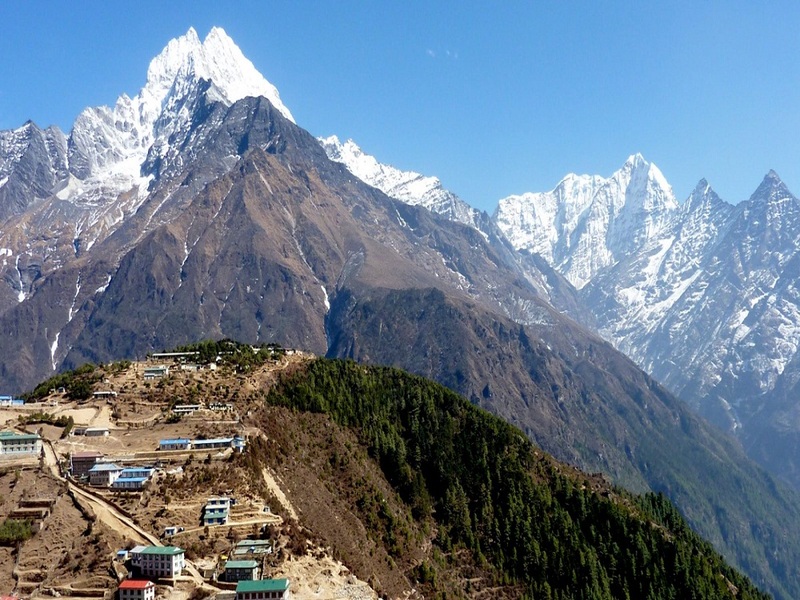 Rolwaling trekking – & Trek information Rolwaling is a wild and lonely high east/west valley below Gauri Shankar 7145m just south of the Tibetan border with Thame in the Khumbu or Everest region at its eastern end. This is a remote and culturally diverse area occupied by Sherpa, Tamang and Chhetri people Starting from Barabise in the west and passing Tinsang La, the trail descends to Bigu Gompa, a Buddist nunnery and follows the Bhotekosi river before turning into the Rolwaling valley. The route goes to Bedi, the last permanent settlement at 3690m and Na, a summer settlement at 4183m before ascending a grass-covered valley to beautiful Tso Rolpa lake. It then traverses a moraine on the north side of the valley and the snout of the Tram Bau Glacier. Great care must be taken on the glacier and the crossing of the Tesi Lapcha La 5755m into the Khumbu can be difficult. 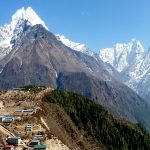 This spectacular route then drops to Thame and follows the Bhote Kosi river to Namche Bazar and on to Lukla for a flight back to Kathmandu. Rolwaling Trekking Trip Highlight. Day 02: Kathmandu sightseeing, Hotel. Day 03: Drive to Dolakha (1660m) (5 hrs), Camp. Day 04: Trek Dolakha to Piguti (910m) (4 hrs), Camp. Day 05: Trek to Suri Dobhan (1,030m) (5 hrs), Camp. Day 06: Trek to Jagat (1,150m) (5-6 hrs), Camp. Day 07: Trek to Simagaon (1,990m). (5 hrs), Camp. Day 08: Trek to Kharka (3,440m) (6 hrs), Camp. Day 09: Trek to Beding (3,700m) (4 hrs), Camp. Day 10: Rest day at Bedding, Camp. Day 11: Trek to Na (4,183m) (5 hrs), Camp. Day 12: Rest day at Na, Camp. 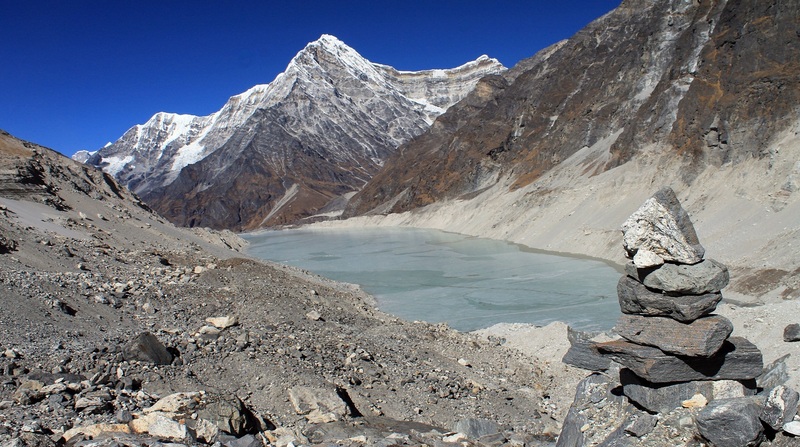 Day 13: Trek to Tsho Rolpa Lake (4,534m) (7 hrs), Camp. 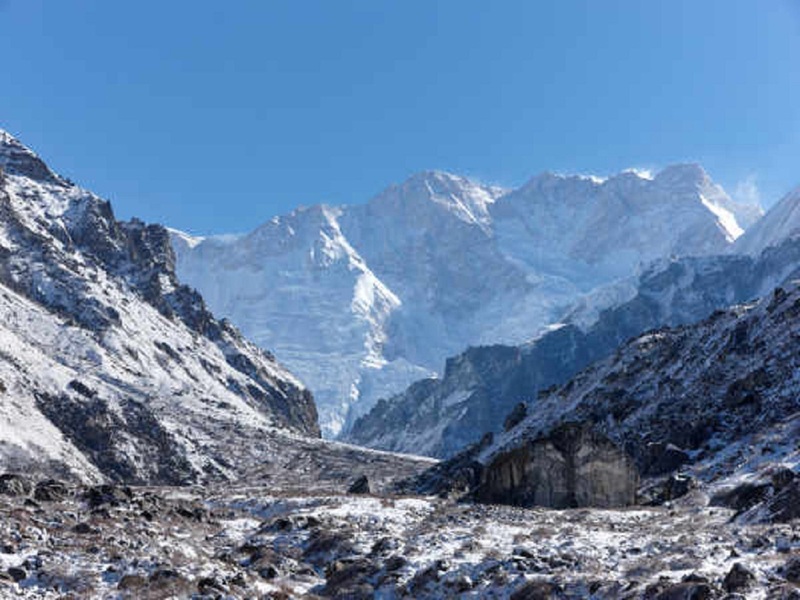 Day 14: Trek to Tashi Lapcha Base Camp (5,755m) (5 hrs), Camp. Day 15: Cross Tashi Lapcha Pass (5,755m) (5 hrs). Continue to Parchamo Base Camp (5,755m) (+2 hrs), Camp. Day 16: Trek to Ngole (5,110m) (5 hrs), Camp. Day 17: Trek to Thame (3,800m) (5 hrs), Camp. Day 18: Trek to Namche Bazar (3,440m) (5 hrs), Camp. Day 19: Rest / Spare day at Namche, Camp. Day 20: Trek to Lukla (2,840m), Camp. Day 21: Fly Lukla to Kathmandu. Hotel.